I put together a small python script to display CPU/memory/network/disk-io graphs in the system tray. --size SIZE      Icon size in pixels. Default: 22. --bg BG          Background color (RGBA hex). Default: #00000077. --fg_cpu FG_CPU  CPU graph color (RGBA hex). Default: #3f3. --fg_mem FG_MEM  CPU graph color (RGBA hex). Default: #ff3. --fg_net FG_NET  CPU graph color (RGBA hex). Default: #33f. --fg_io FG_IO    CPU graph color (RGBA hex). Default: #3ff. Potentially a nice script, but I only get the tooltip information for Network and Hard Drives. No graphs. Am I missing a sensor, or what? The icons are just blank (gray)? Most of the time, the network and disk activity icons are empty for me too, simply because there is no activity. But the CPU and memory graphs should display something. What happens if you run the program 'stress -c 1'? Yes, the CPU and Memory are fine, and I'm not surprised that the disc activity registers as 0. 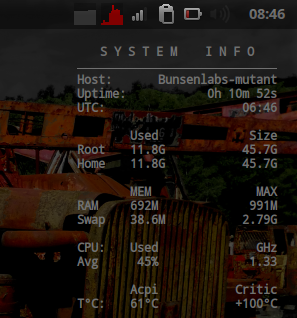 However, the network can be very active (streaming radio - my Conky indicator is maxed out), but nothing is being picked up by the network graph in the tray. Maximum value for the network usage graph, in Mbps. --io_scale IO_SCALE   Maximum value for the disk I/O graph, in MB/s. The value specified there will be the maximum value that can be shown by the graph. For instance, currently the network graph is full at 40 Mb/s of traffic (that is 5 MB/s). Since the graph is 22 pixels high, a pixel shows about 2 Mb/s of traffic. If you have less than that, the graph will be empty. Thanks. That solved the problem. Great script. Now, how about a script for launching the openbox pcmanfm-bookmarks.pl pipe from the tray? As I am not fond of Conky, I like not having to show desktop to have a look at my system, so your script is perfect for that. I just would like to have an option to show Text instead of graph (or text on top of the graph). For example I would like to see "1.21 Gb" onto memory graph, without having to move constantly the mouse to show the tooltip. I'm using PyGtk to show the icon, adding text like that won't work. at least the result is the same as htop. Don't know what your command exactly do, but the memory used is 1.4 higher. Don't know what your command exactly do, but the memory used is 1.4 higher. phwmon suddenly fails since yesterday, any idea? I found the solution. The problem appeared after I upgraded my kernel from 4.9 to 4.18 and 4.19. # "3    1   hda1 8 8 8 8"
+        # "3    0   hda 8 8 8 8 8 8 8 8 8 8 8 0 0 0 0"